The luxury homes market is one of the strongest segments of today’s real estate market. 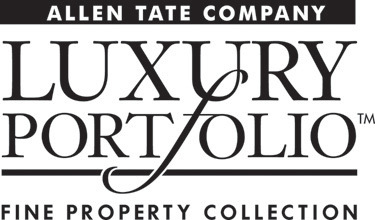 On June 2, nearly 40 Allen Tate agents, clients and business partners sharpened their knowledge of this important segment at a luxury information session and reception sponsored by Allen Tate Company and Luxury Portfolio International®, a division of Leading Real Estate Companies of the World®. The event featured presentations by Stephanie Anton, executive vice president of Luxury Portfolio International; Pat Riley, president and COO, Allen Tate Companies; and Stephanie Gossett, regional vice president, Allen Tate Companies. The invitation-only event, held at the Johnson Carriage House and Meadows in Mooresville, N.C., attracted clients like Scott Sharpe, a remodeler with Universal Remodeling and Handyman Services, serving the Lake Norman region. Ken Wrench, custom home builder with Augusta Homes, enjoyed learning about international buyer interest in the Carolinas and demographics about the luxury segment. “The average luxury buyer today owns multiple homes,” said Wrench. Candi Schuerger, an Allen Tate Realtor® in Mooresville/Lake Norman who specializes in the luxury homes market, found the event to be very informative. “It was really a cozy, welcoming atmosphere and there was a tremendous amount of great information presented. The presentation by Stephanie Anton really put things in perspective, especially regarding age groups and international buyers,” said Schuerger. Luxury Portfolio International is the boutique group of luxury brokerages within Leading Real Estate Companies of the World®, the largest network of independently branded real estate companies in the world with 500 members, 4,000 offices and 120,000 associates.